Rocco Baldelli lands in Minnesota after a standout playing and coaching career with the Tampa Bay Rays. But Baldelli is still young. In fact, in the last few months, that’s become his defining trait. He is now, at 37, the youngest manager in Major League Baseball. (Previous Twins manager Paul Molitor was 62 when he was let go after four seasons last October.) With the retirement of hometown hero Joe Mauer, the addition of free agents like Nelson Cruz and Jonathan Schoop, and the star potential in young players like José Berríos and Byron Buxton, Baldelli joins a new-look Twins team hoping to improve on last year’s disappointing 78-84 record. He was in demand: Five teams interviewed the Rhode Island native for a manager role. His qualifications include a knack for advanced analytics honed during four years in the Rays’ front office, plus coaching experience, his affable nature, and—in the Twins’ case—his ability to relate to younger players. His youth shows on social media, where Baldelli has tweeted from a Dave Chappelle standup show, a Bernie Sanders festival, and a Halloween party he and Genoa attended as characters from TV crime drama True Detective. He posts snaps of their dog, Bowie the Beauceron—named after a song by jam rock band Phish. “When you attend the shows,” he says, explaining his love for the cultishly followed group, “you’re in this reality where everyone is excited to be there, and everyone is also excited that you are there.” The same could be said of his reality now. Chief baseball officer Derek Falvey (left) and general manager Thad Levine (right) introduced Baldelli at his first press conference as the fourteenth manager in club history last October. 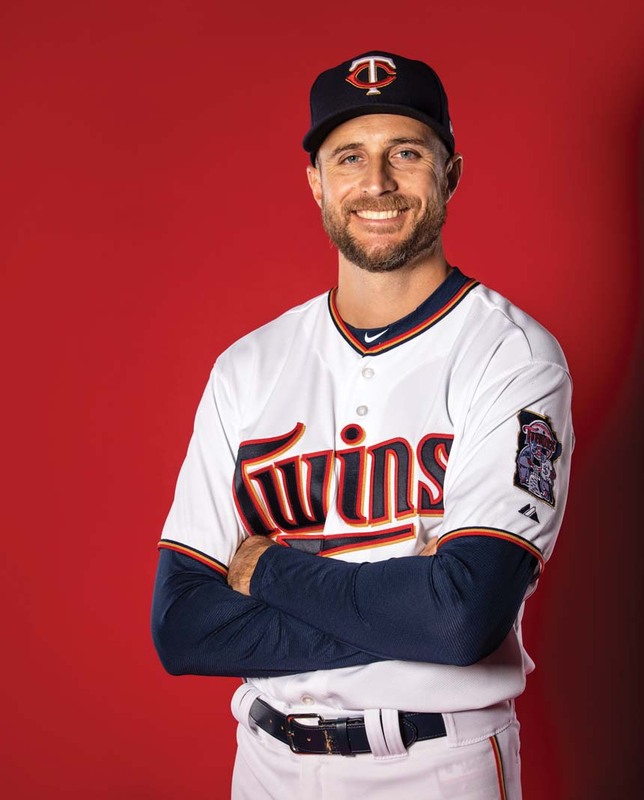 To land the manager job, Baldelli made fast friends with about 40 members of the organization—players, senior leadership, the Pohlad family. He accepted last fall, citing Minnesota’s sense of community. 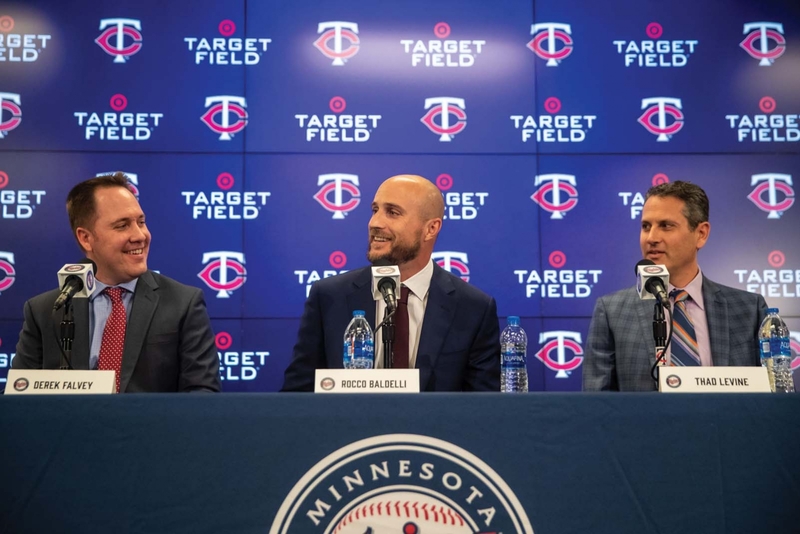 At his first press conference, general manager Thad Levine and chief baseball officer Derek Falvey praised his heart, humility, and willingness to listen, and Baldelli says he couldn’t be happier—even if Target Field isn’t where he figured he’d end up. Raised in Woonsocket, Rhode Island, Baldelli got his start as a standout athlete. He was a competitive Italian-American kid who played a sport for every season—from volleyball to soccer, football to karate. By high school, his baseball abilities had attracted attention from the pros, and, in 2000, he was chosen sixth in the Major League Baseball draft. He zipped through the minors, won Baseball America’s Minor League Player of the Year Award in 2002, and finished his first major-league season with a .289 batting average. The nickname that he finds embarrassing, “Woonsocket Rocket,” materialized out of TV news—part of his notoriety as a “five-tool” player, or one skilled in every position. Our conversation winds down, and there’s another journalist to talk to. “The interviews where I just have to talk about myself the whole time, that’s not what I love to do,” Baldelli says, diplomatically. He would rather talk about the players. “It’s a very communal sport. A lot of people dedicate their lives for the Minnesota Twins. Each person is responsible for other people.” He continues, “These [profile] pieces kind of fly in the face of—respectfully—everything we do on a daily basis. Which is: What is the best thing for our group and our players and our staff?” I suggest that this sounds like a great way to live. The Twins play their home opener at Minneapolis’ Target Field against the Cleveland Indians on March 28.